In April 2013, ABB Reportages published a 12-DVD collection in memory of the late French composer Olivier Greif (1950-2000), rewarded with a ‘Diapason d’Or’ by the French classical music magazine Diapason. 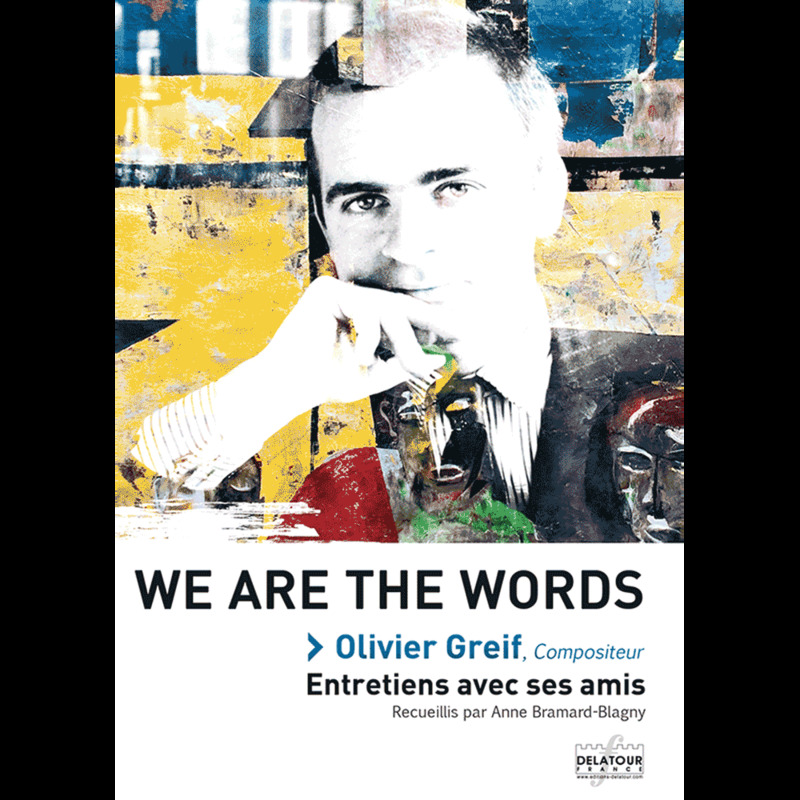 We are the words – the first book printed about Olivier Greif’s life and work – aims to extend by means of a written work the twelfth DVD of this collection and sketches a portrait of the French composer through the words of his friends and performers. Some of the greatest names of the French contemporary music – composers, performers, festival programmers or conductors – such as late Henri Dutilleux, Marc Minkowski, Jean-Claude Casadesus, Yves Petit de Voize, Emmanuelle Bertrand and Pascal Amoyel, contribute to this collective effort by bringing their personal testimony in the form of interviews. Stories, anecdotes, thoughts and memories, issued from about thirty different points of view, seek to bring to light – as so many spotlights on Greif’s life – the personality and the genius of an unfortunately undervalued musician that devoted his life, heart and soul, to the musical creation. 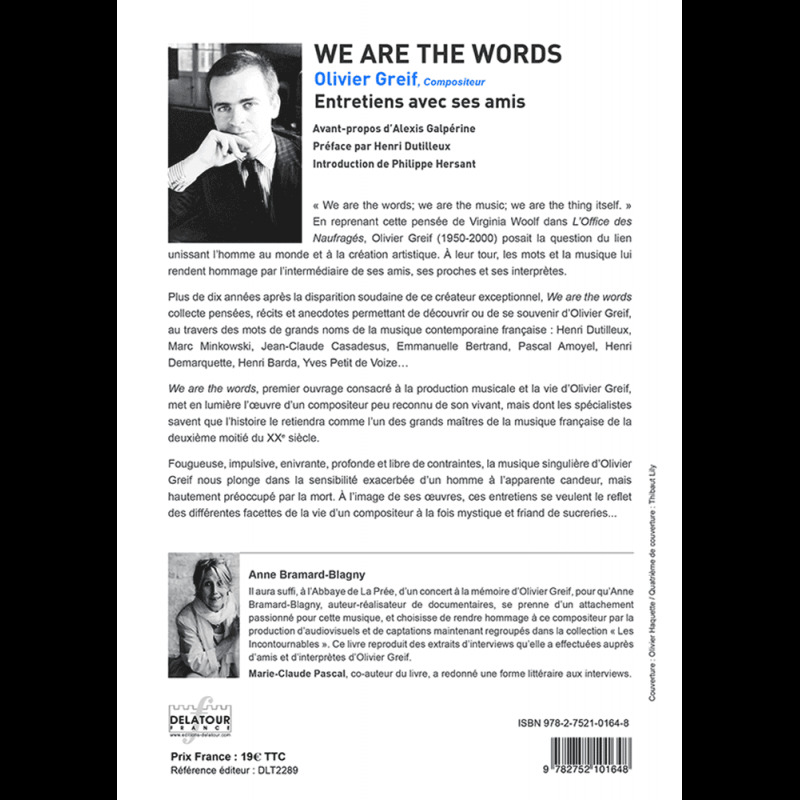 Anne Bramard-Blagny contributes, since 1974, to build an audiovisual heritage based on the research of the true values beyond the borders, generations or beyond any kind of categorization. Anne, who met Olivier Greif and its music during a stay in the Abbaye de La Prée and since then tried to take Greif’s music to official acknowledgment.